Eric A. Stanley, Dean Spade, and the authors of the book Queer (In)Justice (read it if you have not yet) wrote a short piece called “Queering Prison Abolition, Now?” for the journal American Quarterly. You can download the PDF here. There is also a new book review of Captive Genders at Lambda Literary you can read it here. Portland, Ships in the Night and Stanford events! Eric A. Stanley is the co-editor of Captive Genders: Trans Embodiment and the Prison Industrial Complex and is the co-director of the films Homotopia and Criminal Queers. Ralowe T. Ampu currently lives and organizes in an SRO in San Francisco, CA. Along with Gay Shame, she has worked with ACT UP and in solidarity to free the NJ 4. Dean Spade is an Assistant Professor at Seattle University School of Law. Among other things, he teaches Law and Social Movements and Critical Perspectives on Transgender Law. He is the founder of the Silvia Rivera Law Project and is a contributor to Captive Genders: Trans Embodiment and the Prison Industrial Complex. Vikki Law is the author of Women’s Prison Resistance and a long time prison support acitivst; in 1996 she helped start Books Through Bars – New York City; in 2000 she began focusing on focusing specifically on women in prison. Djs: Durt, CLR Jamz, Motive & RapidFire! We will be doing a few mid west events while Nat will be holding it down with a panel at the Anarchist Book Fair in San Francisco. In other exciteing news, the first print run of Captive Genders has almost sold out and it is now in its second run! Captive Genders reading with Eric A. Stanley and Yasmin Nair Friday March 23, 2012 7:30-9 PM Women and Children First 5233 N. Clark St in Andersonville Chicago, IL Here is the fb event page. Captive Genders reading with Eric A. Stanley and Erica Meiners (with special guest Chris Vargas) Tuesday March 27, 7-9PM Allen Hall’s Main Lounge UIUC (1005 W. Gregory Drive Urbana, IL 61820 | *Free parking in garage across the street. Part of the Gendered Barred Colloquium. Here is the fb event page. Thanks to everyone that came out to the events in Berkeley, Davis and Santa Cruz. We have a few more readings planned and would love help getting the word out. Also, Eric and Ralowe will be heading back to Portland, OR April 5-6. Then, on April 7, 2012 Ships in the Night will benefit our drive to offer copies of Captive Genders to folks inside for free, so watch out for that. 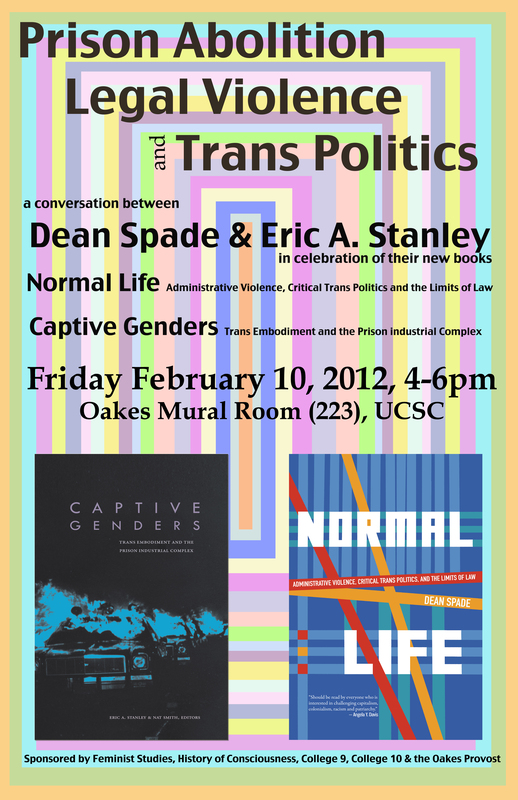 Captive Genders at San Francisco State University with Eric A. Stanley, Nat Smith, Ralowe T. Ampu and Toshio Meronek Thursday February 23, 2012 4-6 pm in the Richard Oakes Multicultural Center Here is the fb page for the event. Captive Genders at Mills College, with Priya Kandaswamy, Queer Studies, Rebekah Edwards, English, Eric Stanley, Nat Smith, Vanessa Huang, Transforming Justice film (5 mins), Julia C. Oparah and Ralowe Ampu Contributor Thursday March 1, 2012 7:30-9pm, Mills College Student Union, 5000 MacArthur Blvd, Oakland, CA, FREE and open to the public. Here is the fb page for the event. Captive Genders at Housmans Book Shop in London Speakers include S.Lamble, one of the contributors to the book and a member of the Bent Bars Organising Collective, and Sophie Barton-Hawkins, another Bent Bars Collective member who has been active in organising around issues faced by LGBTQ prisoners. Wednesday March 4, 2012 7-10pm Here is the fb page for the event. 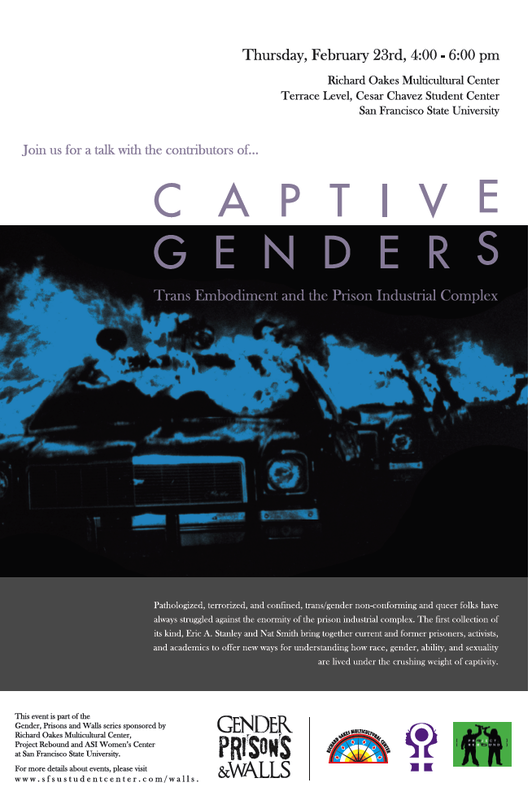 Also, Captive Genders has been getting lots of press which is a great way to spread the word about prison abolition! The NY radio show, Romantic Friendship, talked with Dean Spade and Eric Stanley about both Captive Genders and Dean’s new book, Normal Life (read it). The show was also co-hosted by CG contributor and amazing organizer, Reina July. Book reading Sunday January 8, 2012 5-7pm with: Eric A. Stanley, Lori Saffin, Ralowe T. Ampu and Toshio Meronek Elliott Bay Book Company 1521 10th Ave, Seattle, WA 98122 Here is the fb event page. Panel at the University of Washington, Seattle, Allen Auditorium – UW Campus Monday January 9, 2012 6-8pm. With Eric Stanley, co-editor of Captive Genders, activist with Gay Shame SF, director of Homotopia and Criminal Queers,Toshio Meronek, activist with Gay Shame SF and Critical Resistance, Ralowe T. Ampu, contributor to Captive Genders, activist with Gay Shame, Gillian Harkins, professor of English at the UW, activist and educator with Transformative Education Behind Bars and Lincoln Rose, former private prison employee who does community work on trans prison issues. Event sponsored by The Q Center Here is the fb event page. Reading in Olympia, WA, Olympia Timberland Library 313 8th Ave. SE, Olympia, WA Tuesday January 10, 2012 8:30-9:30pm With Eric Stanley, Ralowe T. Ampu and Toshio Meronek Here is the fb event page. Reading at Red and Black Cafe, 400 SE 12th Ave, Portland, OR 97214 Wed. January 11, 2012 7-9pm Books will be available at the event. Here is the fb event page. Also, check out Ryan Conrad’s review of Captive Genders in 2bmag here. We also hear that the new Against Equality book that Ryan edited is now available from AK Press. Photo from the Montreal event.